If you are the owner of a NFL franchise, you might want to recruit someone like Terrell Owens. No doubt the guy is one of the greatest wide receivers in the history of the league and with him catching the ball, the team’s chance of going to the Super Bowl is surely improved. Whereas if you are the coach having to interact with players day in and day out, you probably want someone just as good but less selfish, less obnoxious, less maintenance, a better teammate… someone like the Hall of Famer John Stallworth of the 70s Steelers comes to mind. Make no mistake. In no way this writer is suggesting that Civic Type R resembles the ego-maniacal Owens. A fabulously engineered machine and the fastest front-wheel-drive car to navigate the legendary Nurburgring circuit, the Type R is way easier to live with compared to TO. That said, image-wise, the Type R is a young person’s car. Combination of that great big rear wing, conspicuous air scoops and vents and side skirts does not mesh well with the middle-aged sensibility. Honda probably knows this. So to those older folks who appreciate the subtler expression of beauty, the company suggests to take a gander at the Civic Si. 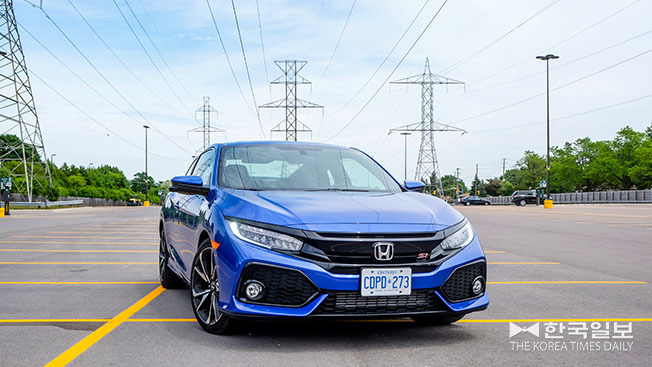 Not as wild and extravagant as the Type R, for sure, but the Si is still powerful enough and handles very well in ways that it makes the driver look better than he or she really is. It does not turn heads but it also attracts less attention from brothers and sisters of the law enforcement. The Civic Si is an all-around capable sporty car is what I’m getting at. The 2018 version is the first Si this writer has driven with the new 1.5 litre turbo mill. The last one had the wonderfully high-pitched 2.4 litre naturally aspirated VTEC many enthusiasts still regard as one of their favourite engines. Still, the 1.5 turbo develops same 205 horsepower as the 2.4 but exceeds the old engine’s torque number by 18 for the total of 192 lb-ft. More than that, the maximum torque is generated as low as around 1,500 rpm for more everyday usable power. Do I still miss the old motor? Yes. But the new force-fed engine is more tractable and gets slightly better fuel economy, as well. Delivering the power to the front wheels is the six-speed manual. There’s no automatic option available so if you are hankering for the Si, you better know how to row your own gears. Compared to the Type R driven last fall, the Si’s stick seems less smooth but I’m nitpicking. On the whole, the clutch action is relatively light and progressive. The throws are short and the lever clicks accurately into well-defined gates. I wish the reverse gear is located to the left and down from the first, but that’s a personal preference. Another thing missing in the new Si is the hand-brake, another personal preference. All models of the new generation Civic now utilize electronic parking brake. No more grabbing the hand-brake during fast corner to induce over-steer. 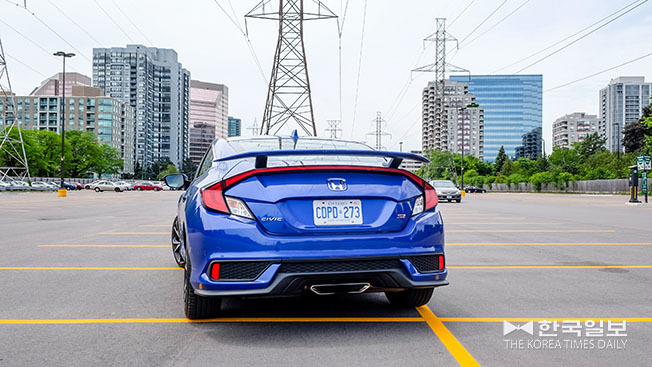 However, in the stick-shift Civics, the electronic ‘brake hold’ acts as a hill-holder, lessening the anxiety of newbies stopped on the middle of a hill. The Si is available both in sedan and coupe guise. This writer’s coupe test-vehicle is priced from $29,090 before taxes and other mandatory fees. It comes with such options as 18’ alloys, supportive cloth sports seats with ‘Si’ logo, nice and thick leather-wrapped steering wheel, auto climate control, navigation and the LaneWatch system that, through a camera attached to the right side-mirror, lets the driver see what’s coming behind the car’s right side when making a right turn. For some reason Si does not get such safety systems as blind-side monitoring, lane-keep assist, collision mitigation, etc. which are available in lesser Civics. I guess Honda expects the Si driver to know how to keep his or her eyes on the road. As for the official fuel mileage, the Si gets 8.4 litres per 100 km in city and 6.2 litres on highway. 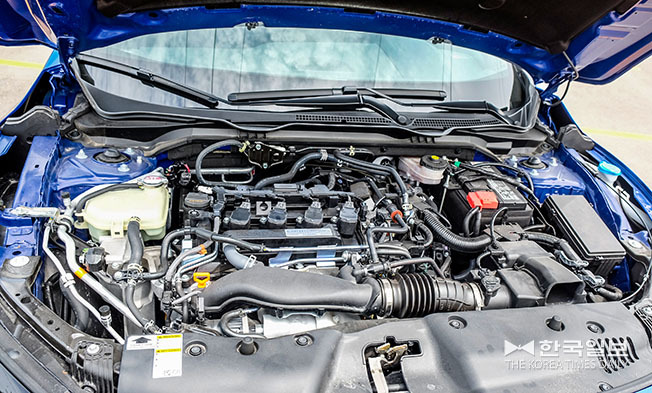 Unlike the less pressurized 1.5 turbo in the regular Civic, the Si’s engine demands premium juice for maximum performance. For the week I had it, thanks to more highway jaunts than usual, this writer observed 6.9 litres of average consumption. Not too bad.